My first release date is less than a month away! It’s exciting! It’s nerve-wracking! It’s the Game of Words! In all seriousness, this Independence Day is going to be a milestone for me. On July 4, my first novella will hit Amazon and B&N (assuming all goes to plan). I had originally intended to begin with the story of the first colony, “The Shot Heard ‘Round the Planet.” Now it looks like that will be coming out later in July. Life happened, and all that. 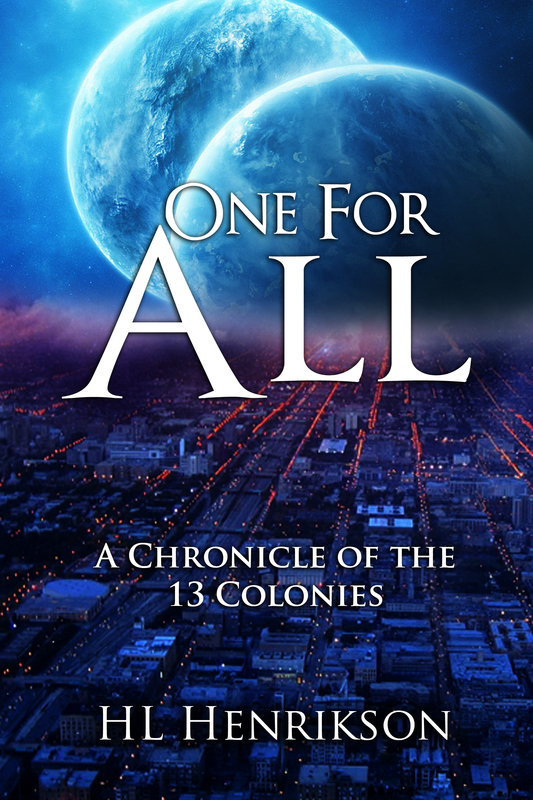 Instead, my launch title will be “One For All,” a tale of Colony 3. Three hundred years after settlement, the third colony looks nothing like its original holdings. Oh, sure – the outlying hills still bear row after row of grape vines, and maybe the way they’re tended and processed remains the same, but inside the city, nothing is the way it used to be. That’s exactly Talbot’s problem. When he joined a top secret agency to protect the welfare of the colony’s citizens, his intentions had been filled with heroics to wipe out the rising tide of crime. Now, several decades later, the degradation of the metaphorical streets continues as if his hard work meant nothing. So when a routine trip to his favorite watering hole puts him on the scene of a murder and directly in the limelight, he jumps at the chance to uncover even the smallest shred of information that might shed light on the rising darkness consuming his city. Except he didn’t count on the girl, or what she might do to his carefully constructed world. One final mission to learn the truth. One last hope to save the cause. One way or another, Talbot will find out what’s going on…even though it’s likely to get him killed. But what’s a life without a cause? And secret agents aren’t allowed to retire. Hopefully my cover art, created by a wonderfully talented old friend, will be done early and I can show it off. If not, you’ll just have to wait for the awesomeness of it. I think it’ll be worth the wait!